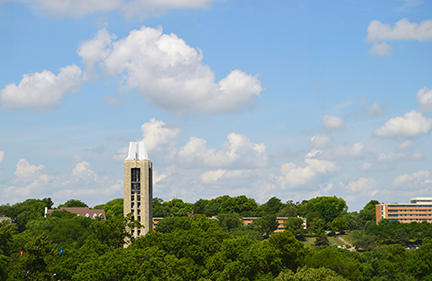 LAWRENCE — The first University of Kansas monthly budget conversation will be 3:30 p.m. to 5 p.m. Aug. 27 in the Spahr Engineering Classroom of Eaton Hall. All faculty, staff and students are invited to attend. These conversations are meant to provide transparency in the current KU Lawrence campus budget circumstance and in the budgetary decisions made moving forward. Interim Provost and Executive Vice Chancellor Carl Lejuez will review the latest information and actions related to budget cuts affecting the Lawrence campus and answer questions. He also will offer an overview of campus spending since the budget town hall in early June. Future conversations will continue the practice of updating the KU community about the budget decisions being made as the year progresses, and each meeting also will include a deeper dive into a specific budget topic of interest to the KU community. In a May 29 message to campus, Lejuez informed faculty and staff of the need for a 5.87 percent, across-the-board reduction ($20 million) of the base budget. The magnitude of cut is necessary to safely move the KU Lawrence campus through the next year and right-size the budget for future years. Years of many long-term commitments and investments that each year exceeded revenue, combined with institutional budgeting practices inconsistent with the current challenges of higher education funding and a decade-long trend of declines in state funding all contributed to the budget situation. Staying the current course is not an option. By making no changes in the coming year, KU will have overspent the budget with no remaining balances to support this overspending. The Aug. 27 budget conversation will be live-streamed on the Provost Office website and recorded for later viewing. A video of the June 6 town hall on the budget is already available for viewing on the budget presentations webpage. Individuals can ask questions or offer feedback through the KU Provost Office email account (provost@ku.edu) or anonymously online through the Provost Office feedback form.